Eleanor Morgan is the wife of Captain Sir Henry Morgan. Coming from a small family in Pembroke, she was briefly married to a Thomas Games, with no children produced during the marriage. She was later reintroduced to her distant cousin, Henry, who found her quite unlike many of the ladies he was familiar with. Educated, spirited and with her own love of adventure, Eleanor was not intending to be the traditional Tudor country wife who was locked away. This greatly attracted Henry, who found in her a kindred spirit and a love match for his third and final marriage. 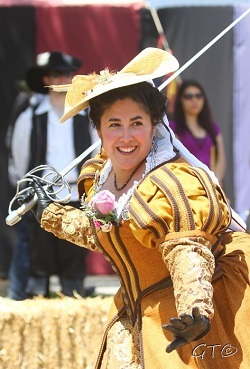 Like her husband, she enjoys swordplay and is trained herself in their use. She also enjoys ships and being on the sea, though with birth of their first child the days of accompanying her husband to sea are likely at an end. Instead, she is learning to find amusement and companionship with the other Captain’s wives, particularly Lady Drury, Lady Frobisher, and the Ladies Hawkins. She is also busily advancing her husband’s career by befriending members of Her Majesty’s court and working with the English branch of the family, the Careys. She enjoys gaming, a good bit of intrigue (though there are rumors of her working for the feared Walshingham), and dancing.